Communication problems, frustration and boredom can manifest themselves in physical outbursts, and working in a residential or domiciliary setting can involve responding to challenging behaviour towards staff and other residents. Supporting Positive Behaviour examines the underlying reasons for the behaviour, ways to spot challenges before they occur and strategies to minimise or prevent incidents. This interactive workbook will help staff to understand appropriate interventions, how to monitor and record challenging behaviour, and implement strategies that will reduce the behaviours over time. The book is appropriate for all staff supporting people with mental health needs, people with a learning or physical disability, older people and people with dementia. 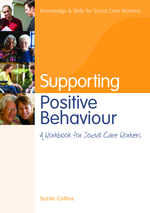 This workbook is a valuable source of guidance for any social care worker keen to improve their practice, and represents a cost-effective way for managers or trainers in residential and domiciliary settings to train staff. Introduction. Responsibilities. What is behaviour? Causes of challenging behaviour. Reacting and responding to challenging behaviour. Self harm. How to minimize and/or prevent challenging behaviour. The principles of care: Respecting service users with challenging behaviour. Health, safety and risk. Reporting and recording. Taking care of yourself and being supported. Self assessment tool. Certificate. References and further reading. Legislation and useful websites. The author.